Holy cats, you guys. I'm in Minneapolis for CONvergence, and I'm already so tired that I might actually die, but I am having the BEST time. And as sloppy as this post is going to be, I can't let even one more day go without doing a news update. Anyway, if you have a kid who loves writing or needs to be kept out of the pool halls this summer, please click over and check it out - it should be a fantastic experience for everyone. 2. One Night in Sixes got a terrific review from Michael MacPherson over at GeekChicElite.com. To say I'm on cloud nine would be a huge understatement. I can't even tell you what it feels like to get a Tweet out of the blue from some brand-new person who read your book and loved it. I just can't even. Oh, but here is what I CAN say: GCE is a new site that's covering a huge array of nerd-tacular subjects, and blowing up like you wouldn't believe. From an interview with the cast of Sailor Moon to a review of Disney's new Figment comic and news about the Guardians of the Galaxy soundtrack, they already have a terrific variety of articles up, and I'm way interested to see what they do next. And not just because they obviously have amazing taste in fantasy novels. 3. Books have officially made it stateside! They are a real thing now - and they look GREAT. And like... this is one semester of art history and a whole lot of over-tired emotionality talking here, but I get soggy every time I look at this picture. 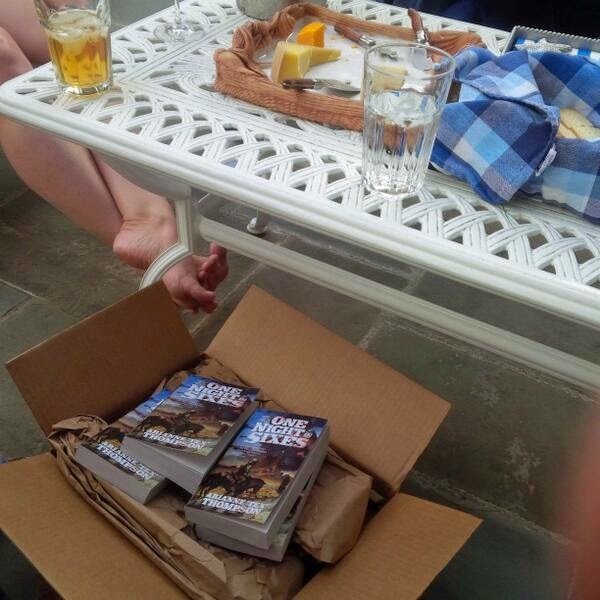 It was taken just this afternoon (my amazing agent Jennie took delivery of the books for me and invited a whole passel of us over for dinner at her house, where we opened the box and had much rejoicing.) And it was SUCH a great evening - that perfect mix of awesome weather, old friends, new friends, and fantastic food. But more than that, this right here is how I always want to remember this whole writing gig. Like, the books are there because of the people in my life, photographed with the people (bare toes, tasty nibbles, and happy times included! ), and are there at the bottom of the shot because ultimately they are subordinate to those people. Anyway, bed now, game face on tomorrow. Please holler if you're around the con this weekend - it's my first time here, and I would love to meet some new northerly friends! Congrats, Tex! WOW - I'm so envious of you being at the CON - if only I had wings I'd have flown down there. Damn flights were just out of reach. Enjoy it for me, will you. I can't wait to get my mitts on one of those books. I sure will - and likewise; please soak up every ounce of joy and life at SIWC, and know that I will be shivering with envy until I can make it up there and see it (and you!) personally! This is is exciting! Have a great time! I think I was so excited, I stuttered. Man, sit down next to me - if stuttering is the worst thing I do in all this, it's gonna be a GREAT time! Can't wait to get my copy!!! Definitely a moment to remember forever! I love the new type treatment on the cover, BTW. Well, new to me anyway. I haven't seen it like that before. And the colors look punchier. Dig it. Oh, I'm so glad you like it - I do too! (But your "like" carries a lot more professional/critical weight than mine, so I am even more delighted.) Thanks for the love and the vote of confidence - miss you, BTW! Congratulations on your well-deserved success! Thanks, Cynthia! And I don't think I've said so, but congrats on making it through the school year - I hope that writing is fruitful for you this summer, because I would LOVE to get to write the same thing on your blog!